All the feelings can be shaped with clay. Coming from the soil and melting with life, the emotion of the moment is now shaped after the baking test. It is now viewable, touchable and usable. 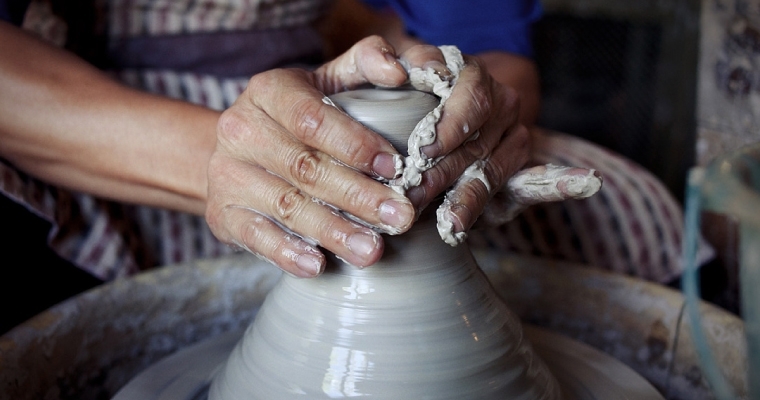 Pottery hardens the emotions and thinking. With the shapes, they are now instrument. Ceramic Art Workshop introduced the drive of art to commercial activities. They are all hand-made pottery work and cups, plates, and spoons here are all unique works second to none. Most tea making instrument used in Jioufen Teahouse is made here manually. Tea Instrument of Jioufen Teahouse mostly made by Ceremic Art Workshop. Ceramic Art Workshop is the first of its kind in Jioufen and the one only where makes and sells its own products. In addition to supply Jioufen Teahouse and Artist Teahouse, products are often sold for household use due to the safety guarantee of 100% hand-made process and free contents of toxic raw material baked under the temperature higher than 1,203℃. The pottery works designed by Jioufen Teahouse and Ceramic Art Workshop has known as the best souvenir for your trip to Jioufen. Pottery works by the workshop presents.